NEW YORK, NY--(Marketwired - May 24, 2016) - HLP Klearfold, the leading global supplier of visual packaging, earned a Silver Award in the 28th DuPont Awards for Packaging Innovation for the Klearfold Keeper® Package -- Enigma USB Hardware Encryption & Decryption Device, which encrypts (and decrypts) files and folders on computers, external drives, or in the cloud. The winners were announced on Monday, May 16. The DuPont Packaging Awards recognize innovations in the supply chain that truly excel in Technological Advancement, Responsible Packaging, and Enhanced User Experience. As mentioned on DuPont's web site, Bill Cunningham, DuPont Packaging Awards program leader, said, "We honor packaging innovations that use science, inspiration, and creativity to shift the paradigms and change the way we live." 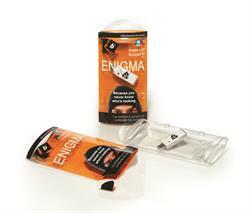 The Enigma's sleeve is made of 14 pt. APET and printed seven color UV offset, plus varnish, and one-color, white, silkscreen printing. The fold-over thermoformed tray is produced from 18 pt. APET. With its distinctive shape, packaging simplicity, and high-quality printed graphics, the Klearfold Keeper visual package clearly achieved BlackSquare Technologies' desired product positioning. The Klearfold Keeper/Enigma package also won an IoPP (Institute of Packaging Professionals) AmeriStar Award in 2015. HLP Klearfold won a 2016 Silver DuPont Packaging Award for this innovative, tamper-evident sleeve and vacuum-formed tray system for the Enigma USB Hardware Encryption & Decryption Device from BlackSquare Technologies.